How was your weekend? We had colds, but we went to the Zoo on Saturday night with my parents, and all the animals were out and active. It was a lot of fun! As you may remember, I've been dealing with some creative block. I've still been making, but I haven't had a lot of flow, and I've been especially struggling with more spontaneous work like free motion quilting. Without going into too much detail, I think a lot of this creative block is related to the personal stuff that I also alluded to a few weeks ago. The emotional fatigue of that has made it harder than usual to keep my inner critic at bay. If you're struggling with your inner critic-- know that I know exactly how hard, frustrating, and exhausting that is! Hang in there! Friday night, I dreamed about free motion quilting, and I woke up Saturday morning with a fire lit under me to get a quilt on the longarm. I started with pearls and paisleys in the border, and it was going okay, but not fabulously. What I really wanted to quilt was something small and dense but delicate. I debated working on my domestic, but then I tried something else instead. I went back to square one-- the sampler style approach I used a few months ago, and I also returned to design that first made me feel confident as a quilter: the Paisley. After a couple of blocks of paisleys, my confidence was boosted, and I felt the same heady addiction to free motion quilting that I did the first time I mastered paisleys on my domestic. Before the excitement could wear off, I pursued an idea that had been wiggling in the corner of my mind for awhile: McTavishing. I searched Pinterest for ideas and spent time drawing before I quilted. Thankfully, the quilting actually came easier than the drawing. 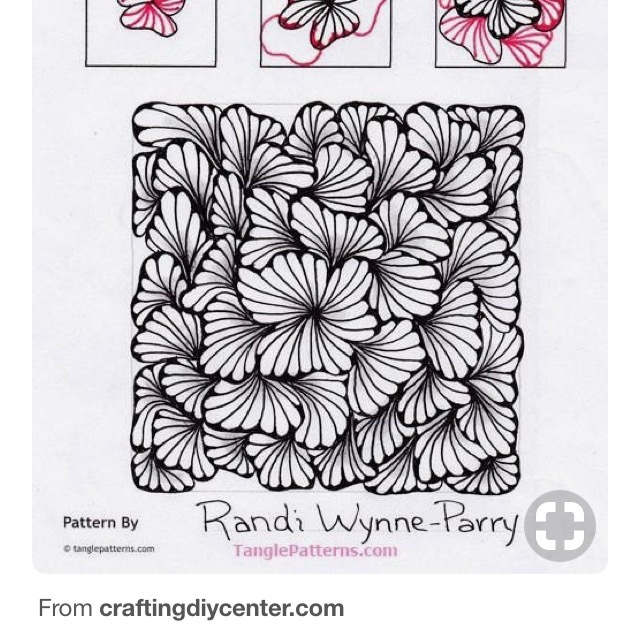 As I was on Pinterest, I learned something that my friend Vicki has been telling me forever: zentangle is super inspiring for FMQ! In fact, I almost find those pictures more inspiring than quilt pictures! For two blocks on the third row that I did this weekend, I adapted a zentangle design. All that to say, I had a lot of fun this weekend! Did you do any quilting? Have you done any McTavishing? Are you looking for some "lesson plans" to help you practice your free motion quilting? Some times knowing what to practice or where to start is just as intimidating as making the commitment to sit down at your machine. Well, take a deep breath and get ready to see your confidence grow with my ebook, Anxious to Adventurous: 10 Weeks to Fabulous Free Motion Quilting. If we haven't already, let's connect on Instagram. I post daily photos, ask questions to start conversations, and goof off in my stories. Also, I have a weekly newsletter that goes out with blog updates, news, inspiration, etc on Saturdays. Plus, by signing up, you get a free download of "3 Easy Ways to Improve your Free Motion Quilting"! Have a great week, everyone! I know mine is a little crazy, so I'm not entirely sure what will be going on here on the blog, but I'll see y'all soon! And I'll be on Insta!